Sundek surfwear is promoted in this international print/poster campaign shot in Cape Town by photographer Riccardo Bagnoli. 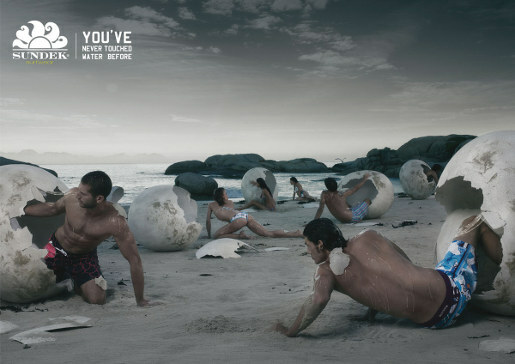 The striking print campaign, shot in Cape Town, South Africa, features surfers hatching from eggs, emphasising the coming out of the new Sundek surf wear. “You’ve Never Touched Water Before”. The Sundek campaign was developed at Callegari Berville Grey, Paris, by executive creative director Andrea Stillacci, copywriter Luissandro Del Gobbo, art Director Giovanni Settesoldi, and art buyer Lauriane Dula. This new work is an effort to meet “the twin objectives of reconnecting the brand with its roots,” while showing “that Sundek is dedicated to surfers,” says agency planner Alex Gaudin. Del Gobbo and Settesoldi recently moved from JWT/Paris to Callegari Berville Grey.